The developers behind the 2D Sci-fi action platformer, Hive Jump, have released a new Kickstarter update this week signaling the launch of their community Alpha among other new gameplay features. Developer Graphite Lab has revealed a new enemy type for Hive Jump in their Kickstarter update called, Swarming Drones. You can see what this enemy type looks like in action thanks to the GIF images the developers provided in their update. There are multiple ways to take care of these enemies, but the developers were sure to note that, while they don’t pack a bunch on their own, as a swarm you can quickly be overtaken if you’re not prepared. 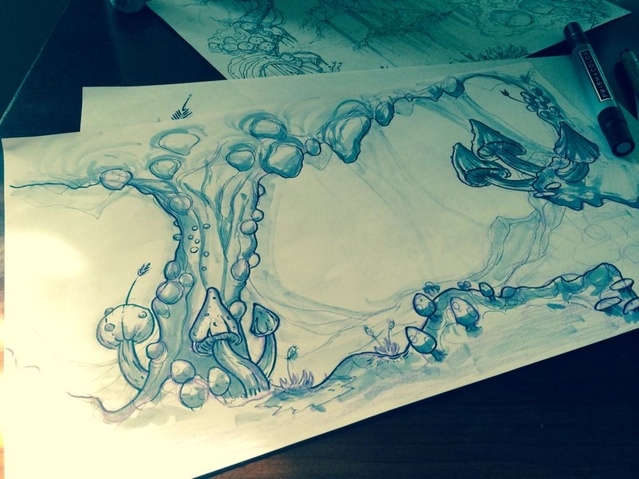 In addition to the new enemy type, the developers also revealed their conceptual plans for a new environment in the game called the Mushroom Forest. Graphite Lab didn’t release any in-game images for the new location in the game, but described it as an underground forest of fungus, which happens to be the Hive’s food source. You can check out the concept art provided by Graphite Labs just below. Finally, the Community Alpha test for Hive Jump’s forums have launched and will be opened to backers and the general public in waves. The schedule for access can be found just below. Stay tuned to Cliqist for further updates on Hive Jump as the Graphite Lab continues to develop the game. Be sure to check out our previous Hive Jump coverage, include the games’ rocky Kickstarter start. Hello there! My name is Nick Calandra and I'm currently enrolled at Northwest Missouri State University to get a degree in Multimedia Journalism. I'm 20 years old and have been playing games since my dad first introduced me to a computer when I was 4 years old. When I'm not working on my own website at OnlySP, I'm either watching the Detroit Red Wings or playing hockey when I have the time. Want to know more, just ask!